New homes in east Gateshead are under way. 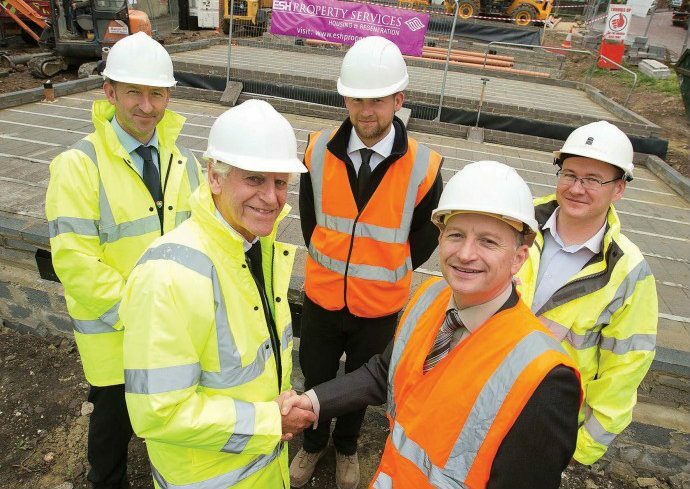 Work on a development to provide new affordable homes for local people in east Gateshead is well under way. Keelman Homes, a charitable partner of The Gateshead Housing Company and Gateshead Council, is investing £1.6m to create 14 new affordable homes at Tarlton Crescent, Felling and Kirkwood Gardens, Wardley. Esh Property Services is carrying out the construction work on behalf of Keelman Homes and the Homes & Communities Agency (HCA), which has funded the scheme. Brian Kelly, Board Chair of Keelman Homes, said: “Following the success of our building of 150 new homes in Kibblesworth we are pleased to be building more homes for families in east Gateshead. The overall scheme is due to be completed by January 2015 and the new homes will be available for rent at affordable levels. Photograph: Front, Cllr. Malcolm Graham and Graham Morgan, Operations Director, Esh Property Services see work start on the building scheme with Phil Gallagher, Head of Investment and Development, The Gateshead Housing Company; Aaron Kingsbury, Esh Property Services and Iain Mullen, Contract Administrator, The Gateshead Housing Company.